Our daily commute to work is one hour and forty-five minutes each way. On a good day, we usually leave the house at 6:00 am and return home at 7:45 pm that evening. Of course this assumes there are no traffic or mass transit delays (and there always are…). As much as we love to cook, the thought of preparing an elaborate meal during the week is out of the question. We are usually ready to crawl into bed by the end of the day instead of tackling a page from Escoffier’s playbook. Cleaning up would also be an inconvenience. Nobody wants to scrub pots while Dave and Jay battle for nighttime ratings. To help limit our dependency on take-out or continuous trips to our local grocer’s freezer section, we have developed a repertoire of several quick and easy dishes that could be prepared during the week. Each one requires a minimal amount of prep work and clean-up. 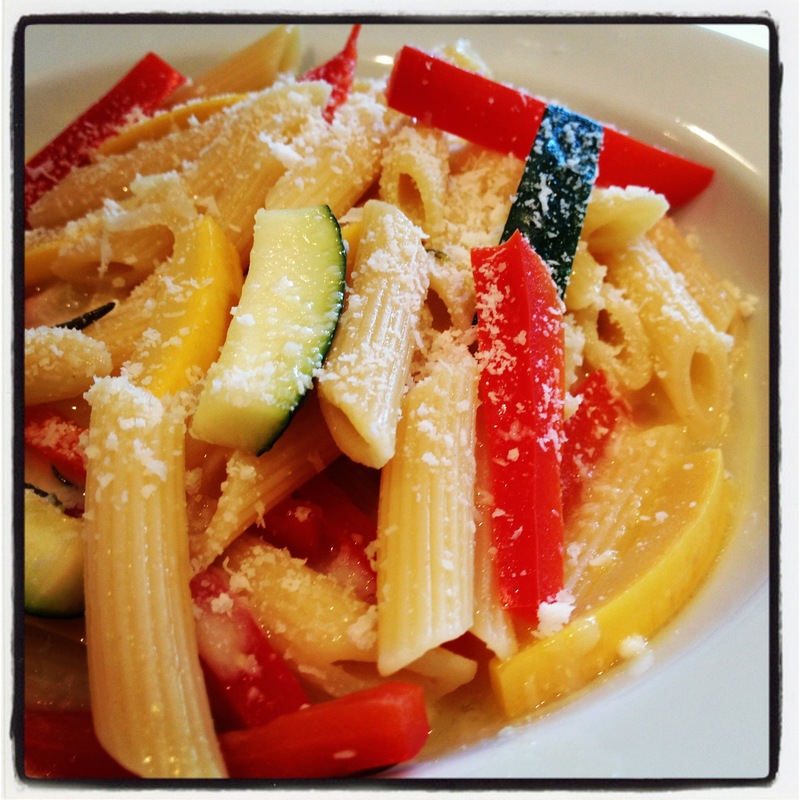 The following Pasta Primavera recipe is a good example. The dish features a light, chicken stock-based sauce with a broth-like consistency. It is flavored with Garlic and Rosemary. The pasta is partially cooked in boiling water then finished in the sauce to infuse it with flavor. A few pats of butter and grated Parmesan Cheese are added right before serving. The dish is best made in the summer when the vegetables are at their peak. Any combination of vegetables can be used. 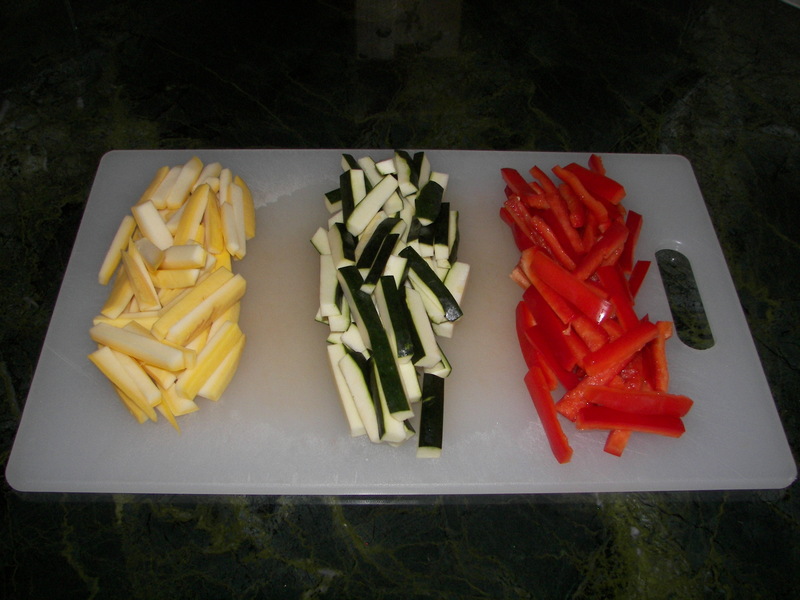 I choose Zucchini, Summer Squash, and Red Bell Pepper to add a range of color. Knowing this dish is on the menu makes the long commute home seem a lot shorter. Select a stock pot and a sauté pan that are both large enough to accommodate the sauce and entire box of pasta. Fill the stock pot three-quarter full of water. Bring to a boil over high heat on top of the stove. 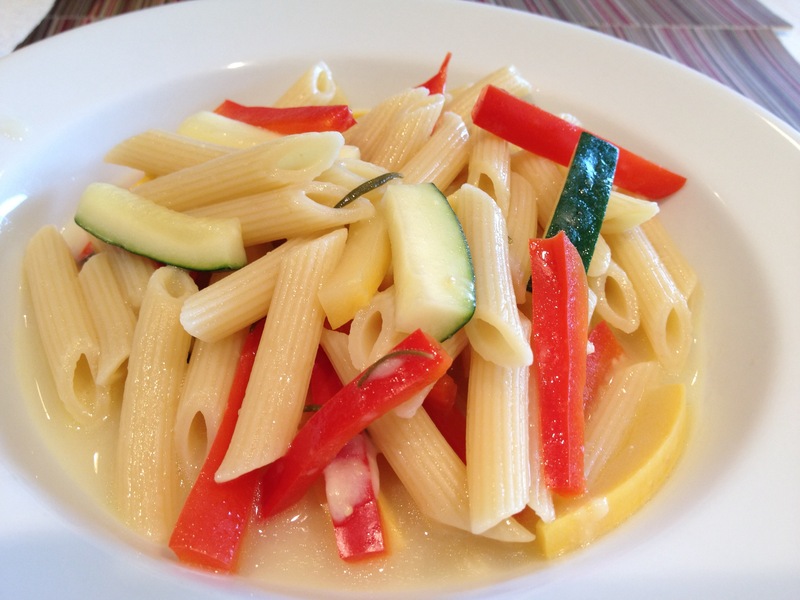 Julienne the Red Pepper, Zucchini, and Yellow Squash into batons the same size as the penne. Add the Chicken stock to the sauté pan along with the sliced Garlic cloves, Rosemary, and 1 Tablespoon of butter. Cover the pan and bring to a boil. Turn off heat once stock begins to boil and allow pan to sit uncovered on the stove. This will allow Chicken Stock and other ingredients to steep. Note: Allowing the pan sit uncovered will concentrate the flavors by reducing the amount of liquid through evaporation. If using a Rosemary spig, do not forget to remove it before adding pasta to the pan. Add salt to water in the stock pot once it comes to a boil. Blanch Red Peppers in the boiling water and cook until just tender. 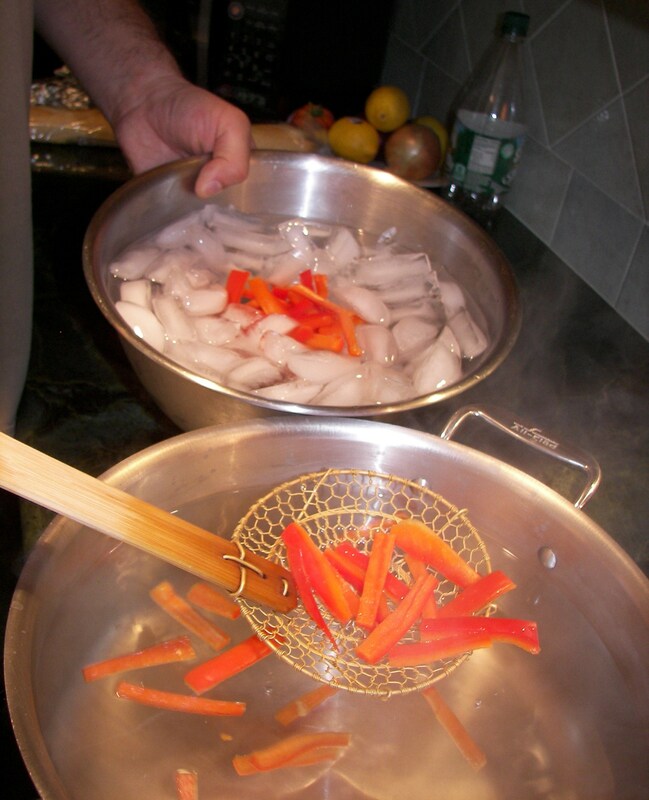 Transfer The Pepper to a bowl filled with ice water. This will stop the cooking process and set the color. Repeat procedure with Zucchini and Squash. Drain vegetables and keep warm for later use. Bring water back to a boil. Add more salt if necessary (the water should taste like sea water). Return chicken stock to a simmer. 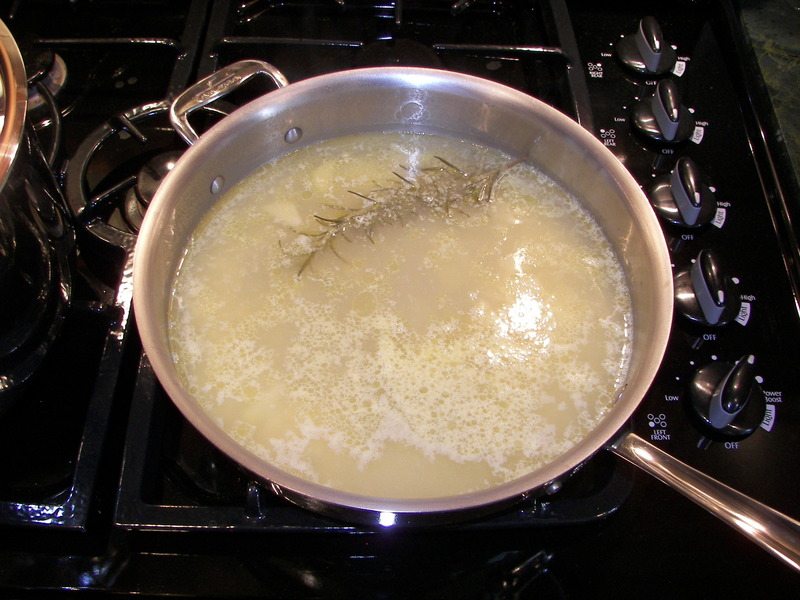 Add pasta to stock pot and cook ¾ of the way through (Approximately 6-7 minutes). Note: Bite into a piece of the pasta. It should still be a little crunchy. Don’t be concerned. It will continue cooking in the chicken stock. Drain pasta thoroughly and transfer to the sauté pan. Finish cooking pasta uncovered in the infused chicken stock mixture over medium high heat. Note: There should be about 1 cup of chicken broth remaining when the pasta is fully cooked. If less than this amount remains, make up the difference by adding the appropriate amount of vegetable/pasta cooking liquid. 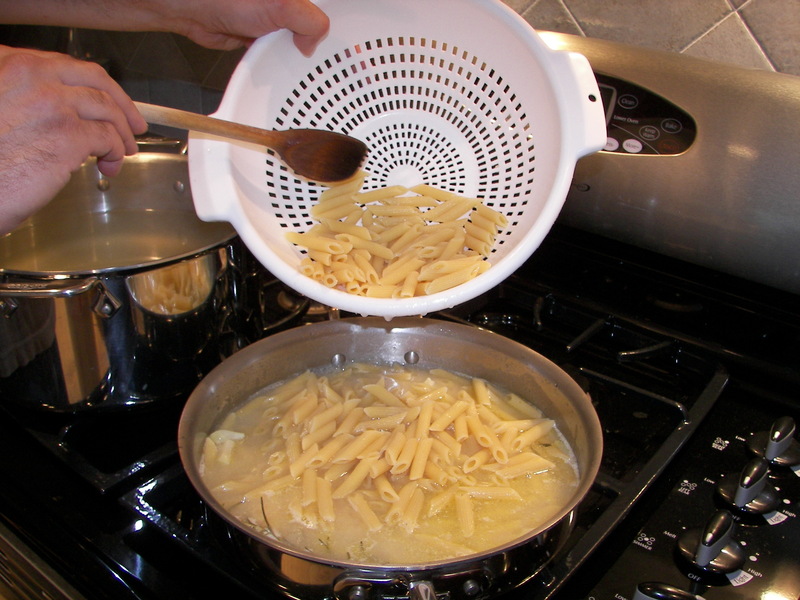 Remove pan from the heat once the pasta is cooked. Stir in 2 Tbs. of butter until it is completely melted. Gradually stir the ¼ cup of grated Parmesan cheese into the sauce. Note: The butter helps incorporate the cheese into the sauce. Their quantities should be proportionate to each other. Extra butter is needed to add extra cheese. The cheese will stick to the spoon and bottom of the pan if the sauce does not contain enough butter. Stir in vegetables once the sauce is complete. The Garlic will be fully cooked at this point and can either be removed or mashed up and stirred into the dish. It will add another layer of flavor. Serve with additional grated cheese to sprinkle over the top.